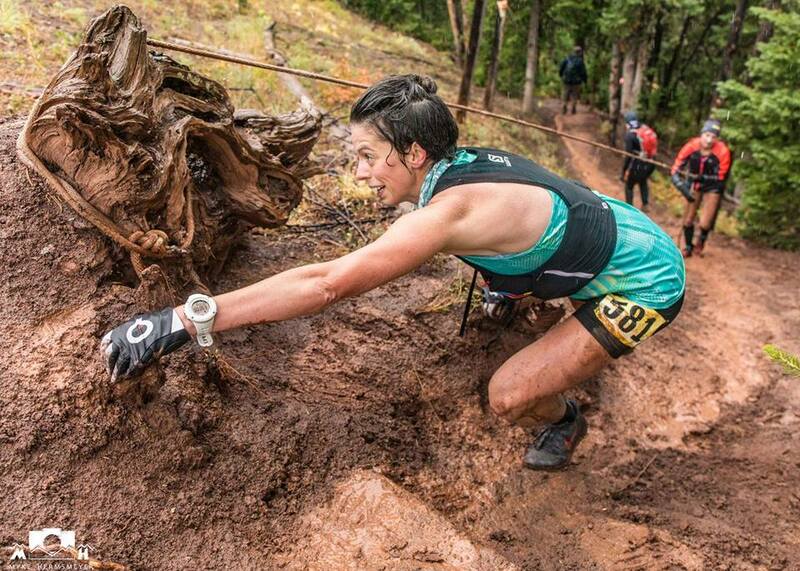 Former Bozeman resident Corrine Malcolm ascending one of the many muddy spots in the 2016 Rut 50K. I missed The Rut this year, but by all accounts it made for another amazing weekend of Mountain Running in Big Sky. Although there were some solid performances in all of the distances, the star of this year's show was the weather. With a course that tops out in excess of 11,000 feet, we knew it was bound to happen eventually. For the first time, race organizers adjusted The Rut VK and 50K to avoid the iconic Lone Mountain summit and the grueling Bone Crusher Ridge. The 50K lost a couple miles and a few thousand vertical feet, but added plenty of mud and even some snow to make things interesting. Full results are available here. And be sure to head over to the MTC Facebook Page to check out some of the great shots that Myke Hermsmeyer posted of your fellow Montana athletes. Last weekend's Big Bear Stampede in Gardiner featured 5K and 9K trail runs on the edge of Yellowstone National Park. What may be the best feature of this event is the slide finish of the kids run. We gotta get something like this for the big kid races! Results here. Yesterday's Missoulian included a story about the upcoming construction project to improve the Orange Street on-ramp to I-90. As part of the project, the Orange Steet Trailhead parking lot will be closed for a few weeks. The trail, which we adopted and has been the subject of much of our trail work over the past couple of years will remain open, but you'll need to get there on foot. The good news is that the end result of this project promises to be a welcome addition for trail users by providing a paved parking area separated from the flow of traffic. The timing of this improvement is perfect. Once the parking lot is done we'll be able to focus our attention on some important trail work improvements to the trailhead. With any luck our trailhead improvements will be in place by next summer. So stay connected with MTC to see how you can help out. Speaking of volunteering... on September 24th, in honor of National Public Lands Day, our friends at Five Valleys Land Trust are organizing a work day on the South Hills Spur of Mount Dean Stone. They're recruiting volunteers to help out with some fuels reduction work, while providing the opportunity to experience some of the lands that are subject to the organization's most recent open space preservation effort. Run Wild Missoula has committed thousands of dollars to land acquisition there and MTC is committed to helping out with this project in any way we can. Attending this work day is a great place to start. To get involved, send an email to admin@montanatrailcrew.com so we can pass along a rough estimate of participants to Five Valleys. The plan is to get a group to meet at 9am at The Keep Restaurant and carpool up to the work site. The work will involve slash piling so they ask volunteers to bring work gloves, water, and a hand saw if you have one. Five Valleys will provide snacks and lunch. It promises to be a worthwhile effort. Speaking of public lands, we're stoked to announce that Montana's original running film festival--the Mountain Running Film Festival--is back for a fourth consecutive year at the iconic Wilma Theater! This year's festival will be a true celebration of public lands, as we've coordinated with RWM to make a trail running weekend out of it! On Saturday, November 5th, run the Elk Ramble 15K Trail Run on Missoula's Mount Jumbo open space and then plan to come out that evening for the Montana running community's biggest party of the year with 900 of your favorite training partners. If you made it out to the film festival last year you quickly realized that the Wilma's recent renovations provide a world class experience, from unbeatable sound to two strategically positioned bars stocked with local microbrews. We still have plenty of planning to do, but expect films featuring local athletes and local landscapes, along with some of the year's best international productions. As always, we'll be giving away products from our sponsors and hopefully be featuring some live mountain music to set the mood! So mark your calendars now! November 5th! The full event announcement will be appearing in the coming weeks.